It is with some slight sense of hope that I read today of Nicolas Sarkozy's openness to an Olympic boycott. 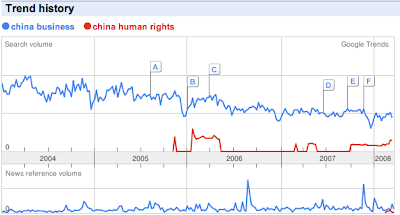 The awarding of the Olympics to Beijing, with China's seriously troubled record on human rights both domestic and internationally, was questionable at the time. 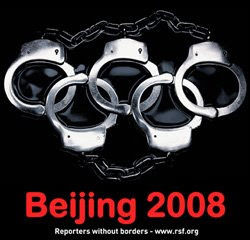 With China's recent clamp down on activists in Tibet, military support for the Sudanese government that supplies Chinese weapons to the Janjaweed militias in Darfur, and continued oppression of dissenting voices at home, serious questions need to be asked by any nation before participating in this summer's Olympics. Yesterday's torch lighting ceremony in Greece was disrupted by a group of activists from Reporters Sans Frontieres, a Paris-based international group promoting global press freedoms. With advocating the right *of* the press to report comes the mandate for the press *to* report, and to call out injustice where it is seen. It was amazing to see a group of Western reporters actually do something because of their principles, as for too long in the West we have grown used to the media being simply an extension of major business interests. China poses a major problem for the West, as we believe that China is a vast open market for us, and we are unwilling to risk offending the Chinese leadership for fear of loosing access to that market. The US media in particular is reluctant to do anything that jeopardises its parent companies' Chinese business dealings, and this has had a subsequent effect on the population at large, who have forgotten Tiananmen and Tibet in the rush to accept the myth of a new market for good capitalists to exploit. No one is interested in the abuses that take place in that mine. I say "myth" because this gold mine is an illusion, the West will never be the winner in any competition with this bold, new China. In China there is almost no separation of business, the army and the government, and this unique form of Chinese capitalism means that there is never a level playing field for international business within China. Western companies can never compete in China on price, because with access to a large prison workforce and miniscule pay for a regular workforce, wages are a negligible cost for Chinese businesses. Western groups will never compete on quality, as most of their products are already made in China; almost every Apple product I own is proudly "Designed by Apple in California. Assembled in China". Finally at any time a local business doesn't like its international competition, the government can rescind those competitors' right to trade in China. China joined the WTO in late 2001 to get access to foreign markets more easily, not to encourage external investment in China. In 2005 the Chinese National Offshore Oil Corporation made an unsuccessful bid for Unocal, at the time one of the largest oil companies in the US, a bid that was blocked directly by President Bush citing national security concerns (not an unusual move when you consider the joint role that Unocal and the CIA had in facilitating the Taliban take-over of Kabul). This was merely the first toe in the water for Chinese state-owned businesses looking to expand abroad, and it won't be long before familiar brand names become subsidiaries of the Chinese government. Meanwhile the US media falls over themselves to make concession after concession to China and suppress any coverage of human rights abuses. Fox News' coverage of the recent Tibet protests is fairly typical, repeatedly casting doubts on claims of Tibetan deaths, quoting mainly from Chinese government officials and using phrases like "it is difficult to verify such claims" when quoting non-government sources. All of this will be swept further under the carpet by the time the Olympics comes around, which is why the work of Reporters Sans Frontieres is so important. Id rather die than give you (multitouch) control.